There are a lot of types of marketing out there, but one that isn’t mentioned as often is relationship marketing. So what is relationship marketing? Relationship marketing is a strategy which emphasizes customer retention, satisfaction, and lifetime customer value. An easier way to think about it is this - imagine you’ve worked hard for new customers. How do you keep them super happy, and wanting to come back? And how do you get them to tell all their friends about you? That’s relationship marketing in a nutshell. It’s building the relationship between you and the customer. Imagine if you stopped getting repeat customers. No, imagine if the customers who did come back never shared you with friends. Well, you’d be stuck constantly fighting to get people to remember you. Relationship marketing works because it gets customers to return to you, and it’s one of the best ways to generate word of mouth, meaning it helps you get new customers too (in a less expensive way than marketing to total strangers). As a marketer, it’s important to believe that growth can be developed through hard work and dedication. This, however, can’t be done unless you’re in the correct mindset - therefore, adapting to a growth mindset can actually create motivation and productivity, thus leading to a successful business and healthy relationships. Let’s cover some ideas that will help you get into the relationship marketing mindset. It’s very easy for a business to get into the mindset that they know everything. The business, however, doesn't know how the customers feel. So, when you start walking in the customer’s shoes or seeing things from the customers' perspective, you get a better understanding of the situation at hand. Sometimes you have to pull yourself back and filter your knowledge of your product. A simple way to do this is pretending to be the customer yourself by imagining you were unfamiliar with your product. This might make it easier for you to remember to treat them how you want to be treated. Think of how you would react if someone screwed up your order, or if a service you bought didn’t turn out as planned. 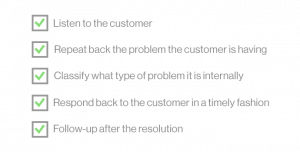 Use this logic to help you sympathize with the customer, and then provide them solutions. This will result in a much better outcome, and can help you grow your relationship with that customer. You may have a checklist, spiel, or procedure you use for each sale or point of contact with a customer. Another good checklist to have in place is a customer incident checklist (see one of the checklists below). This can make handling a difficult customer situation, a little easier. You don’t have to have a crazy or long incident checklist, but if you have something in place, it can help you remain cool as you help them. Here are a few items to add to your checklist. Listen first and don’t react - Instead of disregarding the customer’s concerns, listen to them and address them. Understand why the customer is unhappy, and what they want. Listening is truly the quickest way to turn around a negative customer experience. Tell them you understand (note: this doesn’t necessarily mean you have to agree) - By letting them know you understand their problem, you're also letting them know that you're hearing what they're saying. This works really well when you also restate their problem. Figure out where the problem originated - Let them know if your team made a mistake or if there's a product bug. If the problem was a misunderstanding on their end, figure out a solution to help them, rather than point fingers. But even if the problem isn’t your fault, offer a solution that doesn’t point to the customer as being the problem. And always apologize. Be timely, and follow-up after the fact - If you’re a help desk or receive complaints via email, be sure you're responding in a timely fashion. No one likes waiting around for their issues to be resolved (one unmanaged complaint can turn into a handful of angry customers.) Even after a resolution is made, be sure to ask right then and there if there's anything else you can do. Or, if permitting, respond a few days after the fact, as a follow-up. Stories make it easier to get into the mindset as they aid in visualizing the process. So, when training your team, use a storytelling strategy. This will enable them to see a scenario play out. You may not realize the power of storytelling and mindset, but the truth is, you can change a mindset through storytelling. Stories can help influence and change the way your team thinks and acts. To make your story a true educational tool, you should try to weave in a few elements. The manage of Beans Coffee Shop is telling a story to a new employee. She first starts off by saying “mistakes can happen”. She then explains the story of a customer named Katy who came in to grab a cup of coffee. Robert, the employee who was making her coffee, accidentally sneezed in Katy’s coffee and spilled it all over the counter. The manager then explains that the best and easiest solution to this is to give Katy an apology and a new coffee, at the least. The manager then explains that Robert didn’t stop there, even though he could have. To go above and beyond, he gave Katy a free treat to go with her coffee and even offered a refund. And to top that off, Robert also gave Katy a coupon for a free coffee during her next visit. The manager says, as you can see, a mistake was made, but because Robert apologized and went above and beyond, Katy is still a regular customer. Robert seeded a relationship with Katy, and because of that Katy has since brought in new customers for us because she has a funny anecdote to remember. An easy way to get into the mindset of relationship marketing is to imagine that you can no longer talk to new customers at all. All you have to grow and maintain your business is by working with existing customers. No other channels are allowed - ZERO. How do you make customers love you so they bring their friends? Make your customers love you. Providing good customer service is important for every business. Think of Katy’s experience at Bean’s Coffee Shop - not only did Robert the barista sneeze in the coffee, but he also spilled it all over. The first step in fixing this situation is to apologize. Secondly, make a new coffee. That's basic customer service; seeing the problem, apologizing and fixing. Robert, however, took things above and beyond what Katy expected. Remember relationship marketing is really just about helping the customer. Okay, since you’re in the relationship marketing mindset, let’s dig into how to put it all into play. Your customers are the reason your business is what it is. So listen to their concerns, what they like, and what they want to be changed. If enough people are pushing for one thing, perhaps it’s time to consider some changes. Be opportunistic about when to give away things - discounts, freebies, etc. Obviously, a coffee shop has a little more wiggle room to hand out freebies, but all businesses should try their best and do what they can to make a customer’s bad experience, better. This doesn’t always mean giving things away, but by doing what you can, you turn customers into advocates, and advocates are the base of a strong relationship. Ideally, avoiding bad interactions is the goal, but human (and machine) error can happen. It’s all about how you handle the less than pleasant experiences that can build or bust a relationship. You don’t want to overwhelm the customer, but you should let them know what’s going on. That can mean a sign of new updates by the cash register, or a monthly email sent out. You can even have employees recommend new items/services while talking to customers. Obviously, if you're face-to-face with a customer, it warrants communication. Even though you may have promotional signs around the store, it’s nice to physically point out promotions to customers as well. Don’t worry, you don’t have to go into great detail - hinting at one of the changes can be powerful enough without being overwhelming. If you do want customers to know about every single update, it would make more sense to send those as an email. And again use signage around the store to spark interest. Put the 'service' in 'customer service'. Think of where can you go above and beyond. A good rule of thumb is, the easier it is for the customer to complete, the better. This is why eCommerce stores typically work well - many eCommerce stores keep customers credit cards and addresses on file, making it a fast process to make purchases. On top of that, customers are often allowed to log in via social media, making it very easy for customers to complete transactions. Beans Coffee Shop has an app that enables customers to pay with their phone (just like Starbucks). Since there is money specifically on an app, for that specific store, it’s going to get used and spent at that store. So while being convenient for customers, it also creates a reason for repeat purchases. So when Katy added $20 to her Bean’s Coffee App, she set herself up for a couple future purchases as well. Provide content and training – So you sell a product or service that customers actually use - think SaaS or a tool. Providing additional help to customers who buy these products is key to good relationship marketing, especially when it comes to software people often need a little hand-holding. Help Resources like a knowledge base, in-app chat, and videos make it easy for a customer to learn the product and ask questions. Having resources available even when the team isn’t around is just good relationship management. Customers don’t like to feel agitated and helpless. An FAQ page enables businesses to answer common questions/concerns. It also serves as a great resource to customers and often times answers everything they need to know so that they don’t have to wait for answers on the phone or wait for a message to get back to them. Though loyalty programs and referral programs are two different styles of marketing, they're both great additions to relationship marketing. One increases loyalty, while the other uses loyal customers to spread the word. Both of them, however, rely on good relationships. Neither would work if there wasn’t a mutual relationship between the business and customer. Loyalty marketing goes hand-in-hand with relationship marketing. In fact, when you pair those together you end up creating return customers - especially if your loyalty program leads customers to what they want (more product). Another thing loyal customers do is refer, which is why implementing a referral program after working on your relationship marketing tactics is golden. Katy and Bean’s Coffee House had a rough start, but, the relationship really turned around. Katy has since started using a loyalty punch card and is working towards earning a free coffee. She also enrolled in the Bean’s Coffee Shop referral program - so now when she sends friends in, they both earn a free drink from the menu. Automation makes it incredibly easy for businesses to stay top of mind. When you combine automation with your marketing tactics it can be a big win for you as a business. There are a lot of tools out there to help you automate your processes which can save you time and effort. There are a few channels you can travel down to create relationships with customers. Social Media Marketing – This is your place to connect with customers and build trust. You can answer questions, share your brand’s value, and even connect with a little bit of humor. Listening to customer feedback, concerns, praises, and everything in between has never been easier. The cool news is, even though you may respond directly, you can automate messages and updates. Tools like Buffer help you stay in front of customers, without you having to do much work at all. Depending on what type of business you have, you may be able to get a head start on your relationship marketing efforts. For instance, some stores may be able to get some valuable customer information. This can help make future transactions easier and more customized for the customer. Track customer info - Start with the customer’s name - whether that be remembering Katy’s name, or using a form online (typical with eCommerce). Remembering a few top-level details shows that you want to know your customers. You need to think about what information makes sense to capture or remember. A coffee shop isn’t going to keep credit cards and addresses on file like an online shop. Tracking these things online for eCommerce makes sense, and it can entice the customer to keep coming back out of convenience. Create Messaging Tailored to Each Customer - This one is aimed more towards eCommerce. However, if you have valuable customer information, like the customer’s birthday, send them a birthday email. Many coffee shops have a frequent purchase or loyalty program. Typically, they send updates and custom emails to their customers, including a quick birthday message. Like all marketing, relationship marketing is all about increasing sales and expanding awareness. Hopefully, you can see that it does differ, however, in that it is marketing aimed towards current customers rather than new customer acquisition via sales and advertising. How do you plan on implementing a relationship strategy to keep current customers happy and loyal?